At the time that I’m writing this article, all the races offering KPR points for Kona 2012 have been completed and WTC has updated their rankings to show which PROs have already accepted or declined their July slots and which PROs will be able to claim the remaining August slots. I don’t know why Carrie turned down her slot. She posted her reasons on her blog. Basically, she wants to race some more races in 2012, and feels that Kona would end her season and thus does not make sense from a business perspective. As I understand it, Raynard ended his professional triathlon career after Kona 2011. He raced IM South Africa 2012 “for fun” (validating his slot), but is not interested in racing Kona 2012. Some of these athletes may decline their slots, so there may be some roll down. The first athletes that may get a slot that way are Tamara Kozulina (UKR, 5.020 points) and Christian Brader (GER, 3.820 points). 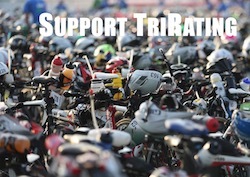 Kona 2012 – Work on my Rating Report has started!